New Delhi, June 8, 2017 (DHNS): Come June 16, consumers across the country will pay a different price every day for purchase of petrol and diesel. State-owned oil companies have decided to revise petrol and diesel prices on daily basis in sync with international rates. The trend is followed in most of the advanced markets. “Daily price revisions of petrol and diesel will make the retail prices more reflective of the current market conditions, minimising the volatility. Further, it will lead to increased transparency in the system. This will also enable smoother flow of products from refinery/depots to retail outlets. Many developed countries are already revising the prices of petrol and diesel on a daily basis,” state-owned fuel retailer Indian Oil Corp said in a statement. The move comes after successful trials in Udaipur, Jamshedpur, Puducherry, Chandigarh and Vishakhapatnam from 1st May, IOC said. 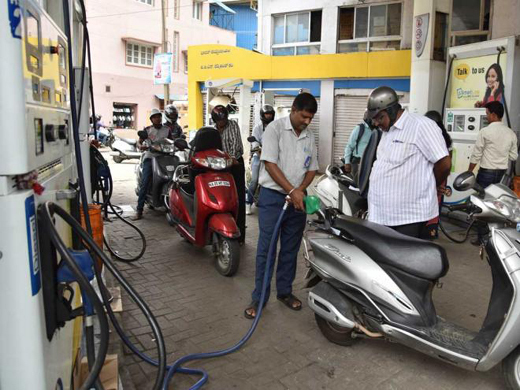 State-owned oil firms -- IOC, Bharat Petroleum Corp. Ltd (BPCL) and Hindustan Petroleum Corp. Ltd (HPCL) together own more than 95% of the nearly 58,000 petrol pumps in the country. At present, petrol and diesel prices are revised on the 1st and 16th of every month based on average international price of fuel in the preceding fortnight and currency exchange rate. The public sector oil companies will publish prices of petrol and diesel in the newspapers every day for public convenience, the IOC said. “State OMCs are taking steps to establish an appropriate mechanism for conveying the prices to consumers every day, including daily publishing of the prices in newspaper on a daily basis, prominent displays of prices at the retail outlets, sending of price-related data/SMS from the centralised locations, mobile apps etc,” the statement said.